DOWN AND OUT: Craig Peacock celebrates his late goal for braehead on Saturday night. Picture: Al Goold/Braehead Clan/EIHL. SHEFFIELD STEELERS’ head coach Paul Thompson was left to lament a “soft” defeat to Elite League rivals Braehead Clan, further hurting his side’s chances of securing a top-two regular season finish. With eight games remaining, the Steelers are eight points adrift of second-placed Manchester Storm, who themselves trail leaders and defending champions Cardiff Devils by eight points. 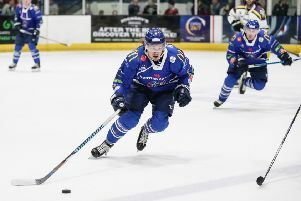 A long road trip to Glasgow on a bitterly cold day was always likely to present a tough assignment, particularly with their Scottish hosts locked in a desperate three-way battle with Coventry Blaze and Dundee Stars secure the eighth and last play-off spot available. It proved to be the case, with the visitors left chasing the game after Braehead struck twice in as many second period minutes around the halfway mark, Landon Oslanksi’s 29th-minute opener being quickly followed by Brendan Brooks’s strike. The Steelers halved the deficit in the 35th minute through Miika Franssila and were again quick to respond through Eric Neiley at 44.30 after Craig Cescon had restored the Clan’s two-goal lead 53 seconds earlier. But as the Steelers continued to push for a third equaliser, Craig Peacock stretched the home side’s lead yet again with just 63 seconds remaining on the clock, with Adam Brace sealing two vital points with an empty net strike at 19.13. TOUGH NIGHT: Ben O'Connor tries to counter a Braehead attack on Saturday night. Picture: Al Goold/Braehead Clan/EIHL. “We had chances early on but we were soft around the net, around both nets and once again didn’t take our chances” said head coach Thompson, for who the only bright spot on the night was the return of forward Rob Dowd after two months injured. “We give up soft goals defensively and nobody is changing a game for us, no one right now. “We knew they would be desperate with their play off situation and they were. I’d hoped after the week we had that we would be fresh and desperate, but we weren’t.